Looks like I won't be able to blog at length until I get to California, and it has nothing to do with being busy preparing for the move and everything to do with a cruel, unsympathetic colleague who's putting preposterous work demands upon me before I leave Japan. Quick summation: mad daily deadlines aside, we're pretty much all set, thanks to my wonderful husband, who has had to handle almost all the arrangements. As payback, he says I have to handle everything once we're on English-speaking soil again. He's taking advantage of my currently apologetic state. And I feel bad enough to let him. Last week: Got Edward microchipped. To enter Japan, your dog must have a microchip that's ISO 11784 or 11785 compliant (in case anyone's confused, we had to get this done in preparation of our return to Japan in a few years). Got a bit worried the night before the chipping, but a quick online search reassured me that it's nothing worse than getting a vaccine and most dogs don't seem to mind. Then we got to the vet and she started saying things about big needles, blood, and it being best if I stayed out in the waiting lounge while they inserted the microchip. After an increasingly tense 45-minute wait, the vet, face strangely flushed, finally stumbled through a door and ushered me into one of the rooms. My eyes instantly fell upon Edward, who lay in a defeated slump on the examination table. (His normal response to those tables is to climb the nearest available person to get off it or simply take a flying leap, never mind that for his height, that must be the equivalent of a free-fall off the Brooklyn Bridge.) Another nurse was pressing some gauze to a spot near his shoulders and it came away bright with blood. Then I saw the needle itself. It was big--2mm wide, the vet said. I think Edward thought so too and tried his best to protest--hence, the red-faced vet. We then had to wait another hour, back in the lounge, with Edward collapsed on the couch beside me like a deflated soup dumpling. When a fat corgi waddled in and Edward's ears didn't even prick, I almost thought they'd drugged him. He remained in this shell-shocked state the rest of the day. and finally had to launch a vulture hand puppet (one of his toys) attack, to coax him out of the Land of the Impossibly Betrayed. He's fine now. And he beeps, like an item getting price-checked at Walmart, when you hold a microchip scanner over his back. It's rather funny in a totally exploitive way. Edward looks sooooooooo damn cute! Very "Woe is me, Can't believe she did me in, Dammit, Im too cool for this, I'm so poor thing." He's seriously adorable. All the best with the move and 'see' you soon when you get to Cal. Awww - poor Edward! I've been sent to the waiting room before and I hate it! On one occasion I could actually hear my cat crying... no, howling. I can't imagine how it must be to have kids! Good luck with your move and with finishing up your job. It will all be behind you soon! oh the poor honey - that face! Wow... seems like you got quite a plateful there. Poor Poor Edward! Breaks yr heart when they sulk in the corner whimpering slightly and looking at you with mournful betrayed eyes, doesn't it? However, I have to tell you that much as feel for Edward, your little excerpt on Edward getting priced got to me bad. I'm still rolling on the floor. I just found your blog, and what a wonder it is! But Edward ... oh my goodness, I could eat him up with a spoon! 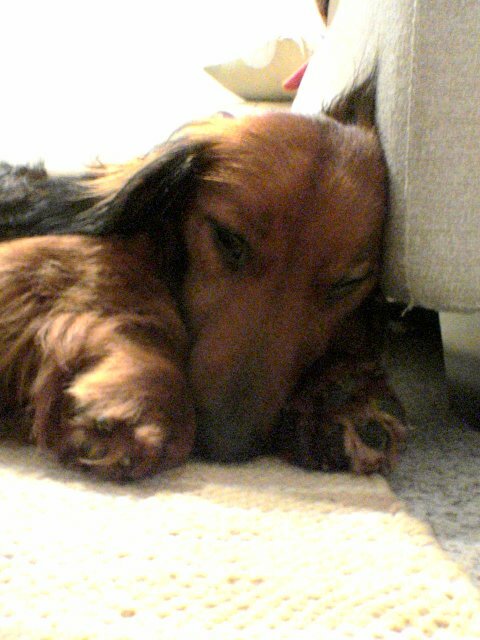 I have a mini-dachsie, too, but mine is a smooth-haired one. Aren't they the sweetest dogs EVER?? I feel terrible writing this but I've pretty much given up on blogging, though I still get alerts when new comments come in. Thanks so much though for dropping by.